What decade is it anyway? I snapped this earlier in the month at Chapter's, as part of an ongoing observation that the music press (like much of commercial radio, too) is stuck in the past. 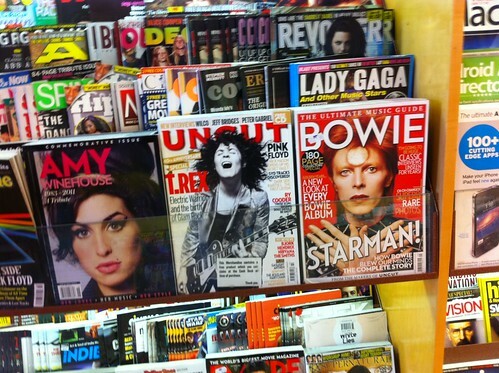 Uncut, granted, always has a backward-glance feel. The Bowie special issue focuses on the same glam era. The Amy Winehouse rush-job seems to fit in, because of her retro style. 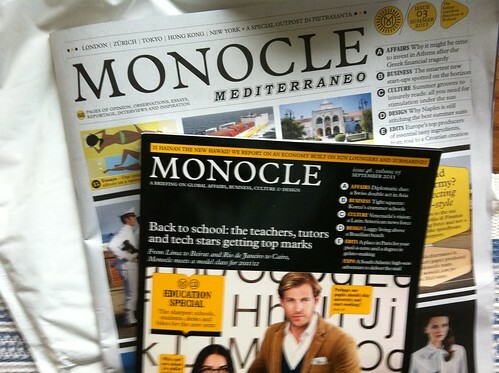 The new edition of Monocle came in the mail a few days ago, with a bonus: a copy of one of the seasonal newspapers that the London-based magazine produces (purportedly for the resort crowd). It's on the agenda for the weekend, with a nice drink. I love poking around magazine stands ... in part because you come across things you had not seen or noticed before. 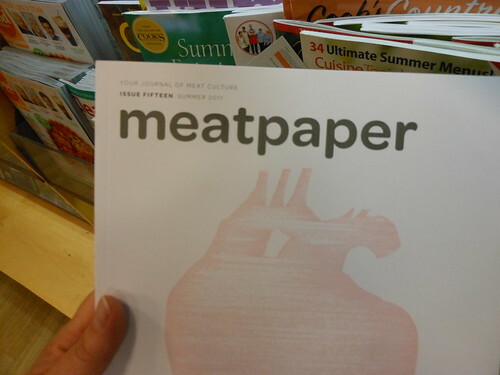 In this case, Meatpaper, "your journal of meat culture." I found this post by Steven Heller on Imprint to be a little slice of magazine history that I had not known about: a magazine called Mobster Times, which seemed to have caught the zeitgeisty Seventies feeling of corruption and decline, mixed with head-on journalism. Above are the first three covers. You can read Heller's account here. Tina Brown's debut at the reins of long-struggling Newsweek has hit the stands. And with a thud, according to this assessment from Jack Shafer at Slate, who notes that Brown has stacked the remade magazine with cliches and worn-out magazine trickery. The nut line: "This is a meal that [a] homeless person would walk away from." I’ve been reading plenty about the iPad and the expected slate (no pun intended) of tablets expected to launch in the months and years ahead, and how life as we know it is about to … blah blah blah. You can fill in the hyperbole by yourself. That said, a lot of it is ringing true. And some of it has been coming from some unexpected types. Like Martha Stewart, for instance. Now, I know I should not be so tough on Martha; sure, she may be a domestic diva of the first order, but she’s also been a technological innovator. (Don’t forget, for instance, that she came to St. John’s once as part of a collaboration with the ill-fated Microsoft online magazine Mungo Park.) Stewart was one of the first publishers to “get” the web, that it required a different approach to content beyond what was in her printed products. So, I suppose, it wasn’t that surprising that Wired, for its comprehensive takeout on iPads and tablets (on why they will … you know, blah blah blah) asked Stewart for her take. Apart from her expectation that tablets will make magazines much easier to enjoy (she practically drools over what could happen with National Geographic), she made a point that should resonate with packrats everywhere. Well, that kind of hit home with me. Let me explain. In my home office, I have scores of magazines – hundreds of them, actually. I’ve clipped pages out of some of them, but what will likely happen (as it has in the past) is that I will sooner or later get tired and send a large of them out for recycling. One of my wife’s long-running to-do projects is to clip preferred features and layouts from her own collection of magazines. So, the idea of digital clipping sounds quite appealing. It’s not entirely new, of course. In the grand old days, when online databases like InfoGlobe were strictly text-based and you paid by the minute, and even before the web as we knew it didn’t exist, I kept directories of “clippings,” or news stories I wanted for reference. That migrated with the web, and I found that copying-and-pasting text was useful. In these pages, I extolled products like AskSam, which made warehousing text possible, and searchable. But what’s been missing is the ability to extract full-resolution “clippings,” distribute them, share them, store them and retrieve them – pretty much as Martha Stewart described above. Managing a personal library with a few taps of the finger. Trust me … there’ll be an app for that. When I was much younger, I developed a thing for Monty Python, from sneaking into a screening of the Holy Grail to staying up late for Flying Circus repeats. The “wall” presented here is a vast array of screens, each one taking you to a howling moment from the Python canon. Do you know something that you’ll need to do in the future? Keep forLater on hand, for sending an email that will arrive with a reminder, just when you need it. Trust me: I can be trusted with the laundry. That doesn’t mean, though, that I can identify on sight what each and every one of those washing symbols means. Here’s precisely the tool for the most obscure icons you’ll find on laundry day. This week’s column is about the iPad, but first, a few words from an unexpected source: Conrad Black. Remember Conrad Black? The disgraced publisher who went to jail for defrauding shareholders, while funneling his newspapers’ money to himself? A larger-than-life figure long before that, Black was the keynote speaker at a Canadian Association of Journalists conference I attended in Ottawa in April 1994. Black’s speech was full of the invective and needlessly complex words we expected – he also made sure that the hundreds of journalists knew that he thought little of many of them – but also had a few surprises. One of them came when Black was asked to speculate on the future of the newspaper. Remember, this was an era when the Mosaic browser was the standard, and the phrase “world wide web” didn’t yet sound that ridiculous. As I recall, Black said while he felt there would always be a market for printed newspapers, he also expected the news to be delivered to some kind of tablet. What it would like, and how it would work, no one knew. It was the first time I heard anyone of Black’s media stature roll out that kind of expectation. Almost 16 years later, I think we got a pretty good sense of where things are going with Apple’s unveiling of the iPad. To be fair to Black, talk of a tablet was in the air – sort of – back then. Apple had released its ill-fated Newton, a handheld device that was a commercial flop, but which prefigured many of the consumer electronics that have dominated our lives in the last decade, from the Palm Pilot to the BlackBerry to, yes, the iPhone. It seems like a fair comment, since the iPad shown to us looks like a wider, longer iPhone, with the fun of an iPod and the broader functionality of a Macbook. But I think that’s missing the point. I expect developers and content producers (including newspapers, but also magazines, television networks and all kinds of ordinary users) to rise to the challenge that the iPad presents. Many people are expecting the new device to be a savior for hard-hit newspapers and magazines. I’d like to see that, too, but I also want the technology to evolve – and the storytelling, too. Let’s say you download a new edition of your favourite magazine. Maybe you’d be content to flick through the pages, ebook-style, but I bet readers will want a richer experience that draws on the strengths of new media. So, for instance, the photograph you see will offer video; the chart or infographic will be animated, and the text itself will have way more than mere web links to enrich your experience and understanding. On the opposite page, where you normally see an ad, expect the marketing folks to make a technological leap. Why put a static ad into an evolving medium that offers so much more? I don’t think the next generation of content will be mere replays of what we already see on the web; rather, it will (or should) be a great, thrilling, imaginative leap forward. I’m not sure if I will order an iPad when it’s released this spring. I want to see if the next generation solves some design issues. However, I’m dying to see to where the app and content developers are going to go with this new platform. I think we’re off to somewhere quite exciting. Cool. There are many, many iconic things to see in New York; let's not forget the fountain in front of Lincoln Center, which - as this video from the New Yorker shows - is familiar to us, even if we haven't seen it in person. A related piece can be read here. The New York Times has an interesting read on one of the great reversal of fortunes in American media history: the fall into massive debt (and loss of relevance) of Reader's Digest, which owns much more than just the magazine of the same name. It's now trying to reinvent itself by holding on to its old audience while finding a new readership online. Pretty remarkable, when you think about it. An artist named Jorge Colombo uses an app called Brushes on his iPhone to produce art for the New Yorker magazine, which is collected on this blog, called Finger Painting. Click on the video below for a sense of how it was put together. Martha picked up a copy of the final edition of Gourmet at the bookstore recently; we're still agog that there's not enough room on the still-crowded magazines shelves (which groan still with specialty magazines on food and such) for a grand old dame like Gourmet. Maybe Condé Nast will revive the title in a future time, like Vanity Fair. In the meantime, I came across this gallery of photos called Last Days of Gourmet, photographed by associate art director Kevin DeMaria. It really puts a human face, lots of them, actually, on the closure. Today's closure of Gourmet magazine came as a shock. Yes, the publishing industry is in a brutal state and everyone is feeling the squeeze ... but Gourmet? It survived wars and cultural revolutions and every media phenemenon since radio. I don't read it regularly, but I always try to record the spinoff show, Gourmet's Diary of a Foodie, which airs Saturday afternoons on PBS (and plays on our television whenever we have a few minutes to enjoy its gastronomic tourism style of journalism). I checked editor Ruth Reichl's Twitter feed just now to see what she had to say. I found the contrast between today's note and a completely different one from Saturday almost heartbreaking.